TAKE DEMAND DRIVEN MANUFACTURING TO NEW LEVELS. 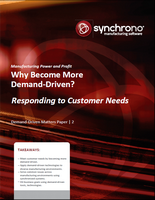 Synchrono® Demand-driven manufacturing software systems are powerful on their own and when united under the Synchrono® Demand-Driven Manufacturing Platform, your demand-driven and Lean efforts reach new levels, as a fully synchronized factory of the future. Synchrono® combines the power of demand-driven planning, scheduling and execution software with eKanban and manufacturing operations capabilities and more — to provide everyone at every level of your organization with a dynamic view of what’s happening at every stage of your manufacturing process; from order inception through production and delivery. SyncManufacturing® – Synchronized planning, scheduling and execution software. SyncKanban® – Pull-based inventory replenishment software for supply chain execution and collaboration. SyncOperations™ – powered by Savigent – Smart monitoring and synchronization of data, equipment and processes. SyncAlert® – Real-time alert notification and escalation management software. The power of the Platform is driven by real-time access to information you need to not only stay on top of your manufacturing operations and supply chain, but to make the right decisions for continuous improvement and innovation. 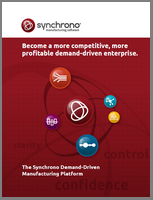 The Synchrono® Demand-Driven Manufacturing Platform synchronizes data from Synchrono® software systems, your machines and your enterprise systems – aggregating, analyzing, and making information available that you can take immediate action on. Constraints happen. Certain work cells can become bottlenecks; machines need maintenance; parts are delayed. With the Synchrono® Demand-Driven Manufacturing Platform, your workforce, methods, materials, machines and information become synchronized in real-time, so you can instantly see issues, drill into the details and stay on top of status. And, should a disruptive event occur, alerts are issued, responders are notified and production priorities are realigned, keeping you on track. Inspiring demand-driven environments has been our passion since inception – our continuous improvement has been to support your continuous improvement. Get in sync. Request a demo and let us show you what’s possible.